Southern junior Gage Shuler (7) breaks away from the pack in the first half, during the Tornadoes’ 57-6 victory on Friday in Racine, Ohio. Southern senior Weston Thorla (4) makes a move against Federal Hocking’s Aaron Burns (30), during the first half of the Tornadoes’ 51-point victory on Friday in Racine, Ohio. RACINE, Ohio — They say you can’t win a game in a half, but they didn’t tell the Tornadoes. 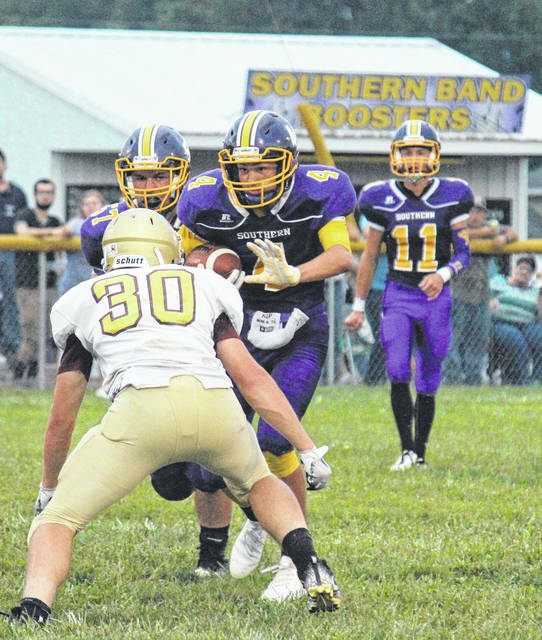 The Southern football team chalked up over 400 yards of offense in the first 24 minutes of play on Friday night at Roger Lee Adams Memorial Field in Meigs County, as the host Tornadoes defeated Tri-Valley Conference Hocking Division guest Federal Hocking by a 57-6 count. 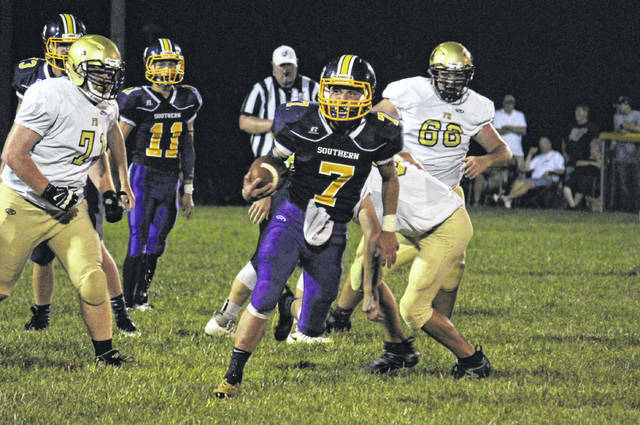 Southern (2-0, 1-0 TVC Hocking) — which has now defeated the Lancers (0-2, 0-1) in six straight meetings — attempted an on-side kick to start the game but failed to recover. Federal Hocking — which has now dropped 33 straight decisions, including 26 in a row in the league — picked up two first downs on its first possession, but fumbled the ball away at the SHS 26. On Southern’s first play from scrimmage, Logan Drummer threw a five-yard pass to Weston Thorla, who tossed the ball to Trey McNickle, who in turn ran 69 yards for the first touchdown of the game. Drummer threw the two-point conversion pass to Brody Dutton to give the hosts a 8-0 lead with 9:25 left in the first quarter. After a three-and-out by the Lancer offense, Southern took over at its own 49. On the fourth play of the Tornado drive, McNickle rumbled 38 yards to give the Purple and Gold a 14-0 lead with 6:13 left in the first. On Federal Hocking’s next offensive play, Aaron Burns broke through the defense, ran 69 yards and crossed the goal line with 5:48 left in the quarter. Southern needed just two plays and 32 seconds to answer the score, as McNickle found paydirt again, this time on a 43-yard run with 5:06 left in the period. Drummer kicked the extra-point, giving the hosts a 21-6 edge. The SHS defense forced another three-and-out, and the Southern offense resumed with 40 yards in front of it. The Tornadoes’ first play went for six points, but was called back because of a holding penalty. Southern failed to pick up a first down in the possession and gave the ball back to FHHS with 56 seconds left in the first quarter. The Lancers punted back to Southern on the first play of the second, and two plays later Drummer connected with Gage Shuler for a 15-yard scoring pass. Drummer made his first of four successful point-after kicks in the quarter, giving SHS a 28-6 edge. The Tornado defense forced a fourth three-and-out on the ensuing Lancer drive, and Southern took over at the FHHS 48. On the first play of the drive, Drummer found Weston Thorla for a touchdown pass, giving the hosts a 35-6 edge with 10:25 left in the half. Another punt after a three-and-out by the FHHS offense gave Southern the ball with 52 yards to paydirt. A false start set the Tornadoes back five yards, but it didn’t matter, as Shuler took the first down hand off all the way to the end zone, giving SHS a 42-6 advantage. After a fourth straight three-and-out, Shuler fielded the Lancer punt at the FHHS 40, and returned it down the sideline for six points. Shuler also ran in the two-point conversion, giving the Purple and Gold a 50-6 lead with 5:59 to go in the second quarter. Southern’s defense forced two more three-and-outs in the first half, with Drummer tossing an 11-yard touchdown to Shuler in between the Lancer drives. The Tornadoes were forced to punt for the first time with seven seconds left in the half, and took a 57-6 advantage into the break. After halftime, Federal Hocking’s defense forced its first three-and-out, but the Lancer offense fumbled the ball and Southern freshman Lincoln Rose recovered. The Tornadoes wound up punting again on the ensuing drive, but once again forced a Lancer fumble, this time with Thorla recovering for the hosts. Both of Southern’s fourth quarter possessions ended in blocked field goal attempts on first downs, and the Tornadoes settled for the 57-6 victory. After the game, first-year Southern head coach Cassady Willford talked about his team’s ability to overcome distractions, and put on an offensive clinic. “Our guys came out ready to play this week,” Willford said. “We had some distractions early in the week, but you know, we overcome things. We had some situations that were private to our team, but these guys came together as a family and played hard tonight. For the game, Southern outgained FHHS by a 442-to-73 count, including 341-to-54 on the ground. SHS held a 13-to-5 advantage in first downs and won the turnover battle by three. The Tornadoes were penalized 10 times for 90 yards, while FHHS was sent back once for five. McNickle led all ball carriers with 258 yards and three touchdowns on nine attempts, while Shuler had one carry for 57 yards and a touchdown. Dutton and Reece Reuter each had 18 yards on a pair of carries, while Andy Doczi rushed five times and earned seven yards. Drummer was 7-of-10 passing for 99 yards, with a pair of scoring passes. Thorla had game-highs of four receptions and 69 yards, while Shuler hauled in three passes for 30 yards, with both Tornado receivers scoring a touchdown. 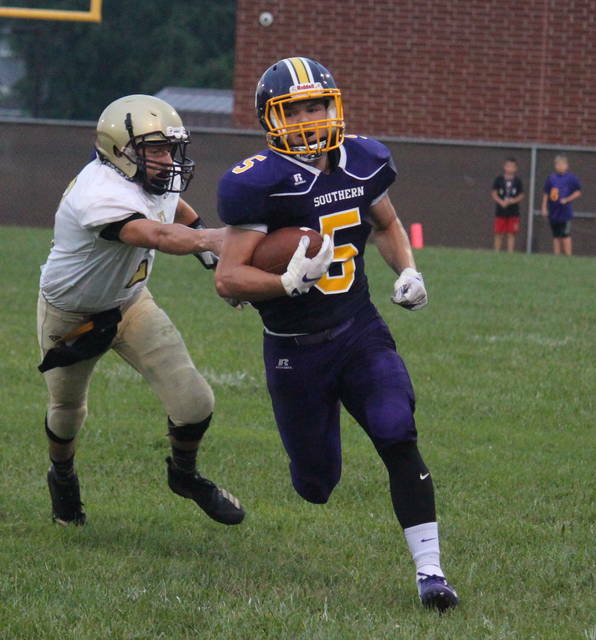 Burns led FHHS with 75 yards on six carries, while Hunter Smith went 3-of-6 passing for 14 yards. Willford noted that, just like the Tornadoes’ Week 1 game, penalties were a problem and will need to be fixed before Southern travels to Wahama next week. 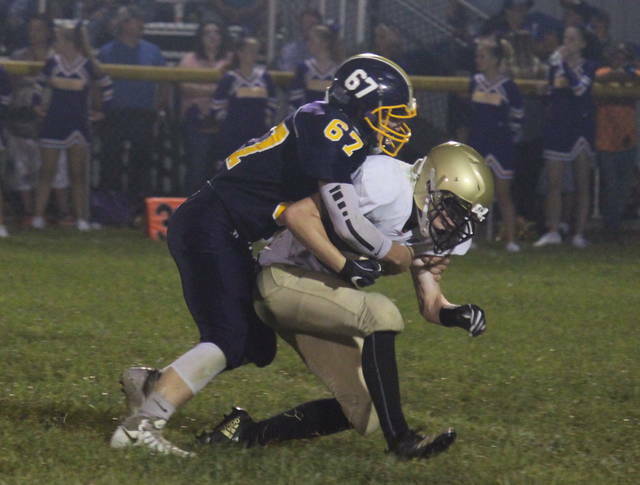 The White Falcons fell at Miller by a 40-0 final on Friday.